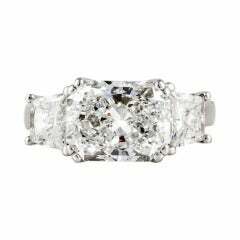 This breathtaking platinum three stone ring designed by JB Star holds a gorgeous center radiant-cut diamond weighing 2.10 carats. 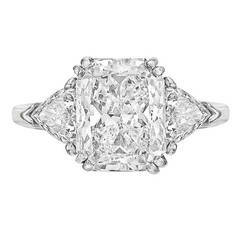 The quality of the center stone is approximately H/VS1. 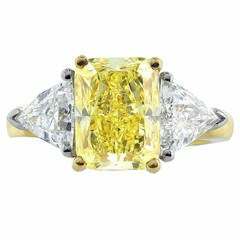 The mounting hold a total diamond weight of 1.60 carats, featuring round diamond accents and pear-shaped side diamonds that share the same quality as the center stone. The rings is gently used with no signs of wear. Currently a size 6 but can be sized upon request. Item shows no signs of wear. Platinum shank has been replaced for resale.